Two years after dusting down Shintaro Katsu's blind Zatoichi persona for his quirky period-drama rejig, Takeshi Kitano is back in his own original territory - with a somewhat intriguing inclination towards double-vision. In the process Takeshis' throws together a smattering of melancholia, a wacked-out sense of humor, tap-dancing musical interludes, a Bonnie & Clyde twist, and touts more guns than a John Woo slug-fest. The narrative structure is as peppered as a spray of bullets from an Uzi. 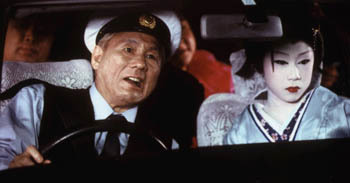 The gist of the story is a shake-down of two characters played by 'Beat' Takeshi (Kitano) himself: one the "real life" movie star/director, and the other a shy, deadbeat convenience store clerk who aspires to an actor. But there's a third overwhelming id here, and that's Kitano's own on-screen alterego from those earlier yakuza romps. The question - which one of these three is the real McCoy? - disintegrates as proceedings reach out on a surreal, metaphysical limb in which dreams interplay with reality, nightmares become farce - and then all swings violently back into an unsure version of the here and now. This makes for a sublime visual feast that's as baffling as it is refreshing. Kitano's trilogy of parts aside, there's a bevy of other doppelgangers, mirror images and dead-ringers rife throughout this movie. Kotomi Kyono, while a tad dull as the movie star Takeshi's girlfriend, bears more than just costume jewellery sparkle in her ulterior role as a glitzy, ditsy yakuza girlfriend who happens to be the deadbeat Takeshi's tormenting neighbor. As the creative synod here, Kitano certainly isn't afraid to poke fun at himself or the genres he's looked at more seriously in the past. But, after teasing with some mischievous insights, he then skirts the issue. And the weak moments in Kitano's earlier film Dolls (2002) - self-conscious "artistic" references - are stitched into Takeshis' with abandon. A recurring clown motif, bullets-as-star-constellations riff, and heavy-handed symbolism (in this case of a caterpillar) almost bludgeon the viewer, as if Monty Python had taken a blunt instrument to David Lynch - rendering it all a bit like Eraserhead on a bad hair day.